IMPORTANCE OF PLACE: Do We Carry Memories of Place In Our Genes? Do We Carry Memories of Place In Our Genes? I recently discovered that in the early 1900s a long-forgotten relative, John Finnemore, wrote a series of travel books about some of the most beautiful places in the world. This was an amazing discovery to me since 100 years later, I've written my own series of travel books, on several of the same places my great, great ancestor wrote about. I found originals of his books on line in a second-hand bookstore in New Zealand, and when they arrived yesterday, I felt like I'd discovered a buried treasure. "A Devonshire lane in the cultivated portion of the countryside has hardly its like elsewhere. The land is red and through this land the lanes run in deep, hollow ways, often so deep that a carriage is quite hidden from the view of one standing in the fields on either hand. One writer speaks of driving in a dogcart along one of these deep lanes on a day in late autumn, when he heard the cry of hounds. The hunt was coming his way, and he drew rein. Presently the hunt went whirling by, literally over his head. Horsemen and horsewomen cleared the lane, one after the other, in flying leaps, the big hunters taking the huge trench with tremendous bounds. These trench-like lanes have been formed by the wear and tear of ages of traffic. In the soft red soil the crunch of wheels and the stamp of hoofs have worn the surface down and down, and rain has washed away the loose soil, until the lane itself has become, as it were, one vast rut. The rich red soil and the soft warm air of this southern county work together to form a scene of wonderful charm. The steep banks are one glorious mass of ferns, wild-flowers, and shrubs during spring and summer; in autumn they burn with the fires of the fading leaves; in winter they are bright with berries." Perhaps the reason I live in Virginia Hunt Country, and love its red soil, its foxhunting, flaming fall foliage, ferns and deep-set carriage roads, is because in my genes, I carry memories of Devonshire and long-ago memories of what it means to be Home. When I first came to Loudoun County, neighbors often asked me how I came to know the area so fast, almost as though I'd been born there. I found it difficult to explain adequately how effortless it was to turn my deepest attention to the undulation of the land, the smell of fresh-cut grasses, and the sound of the fox horn in the Fall distance. 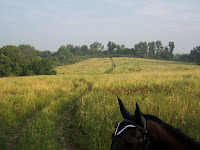 In my book Home: A Meditation on Blackberry Wood, written years before I started doing genealogy, I wrote: "With every gallop across a field and every footfall on the dusty road, I absorbed the spirit of Western Loudoun, and in ways that I was unable to explain or understand, it felt like a returning rather than a discovery." I suspect that all of us, whether consciously or not, carry with us profound genetic memory of places loved by those who preceded us -- perhaps this is the profoundest reason of all for us to consciously create and protect Home and Place wherever we go.